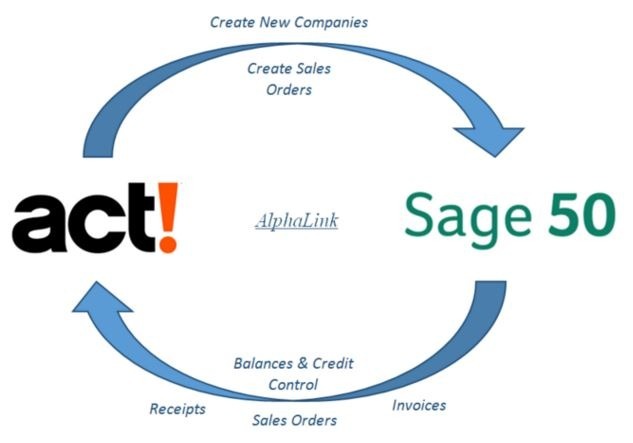 AlphaLink from AlphaLogix integrates your Sage 50 accounting data into Act! giving all staff access to key customer information in one place – their CRM! Version 1 of AlphaLink is available now to get you started. View Sales Orders. (Drill Down Facility, to see line items). View Sales Invoices. (Drill Down Facility, see if an Invoice is paid in Sage 50). View Accounting Information. (Balance, Credit Limit, MTD, YTD, Trading Terms, and On-Hold Status). View Accounting Activity. (Useful for Sage 50 versions without SOP). Import and Synchronise your product list from Sage 50 Accounts to Act! ensuring data integrity between the two systems. Create new Sales Ledger accounts from Act! or link to existing records. Create Sales Orders directly from an Act! opportunity. Update Prices per Opportunity to bring through Customer specific price information. Version 2 is now in development. As you can imagine there is a long list of requests for new features for this much appreciated link. Versions 3, 4, and 5 already have candidate features! If you have any requests for functionality or new requirements please don’t hesitate to contact our team on info@alphalogix.co.uk. You can keep up to date with the product progress here.